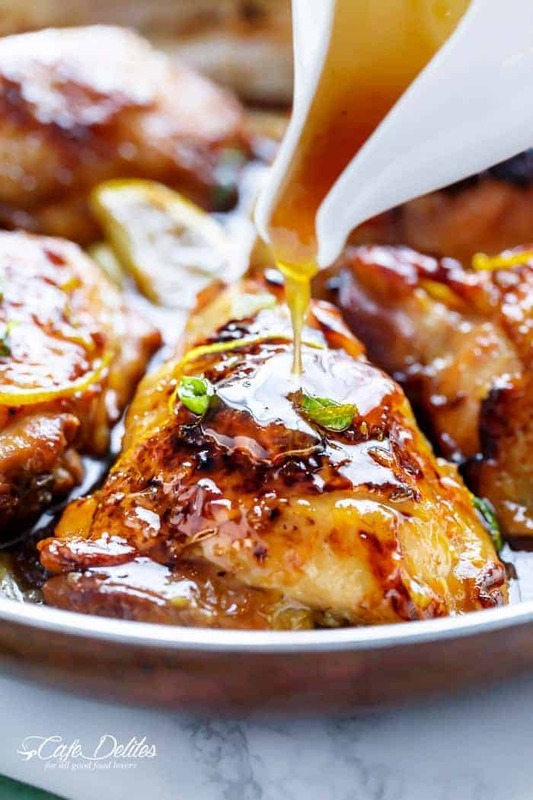 Honey Lemon Garlic Chicken with a crispy skin and a sweet, sticky sauce made up of ingredients you have in your kitchen cupboard! 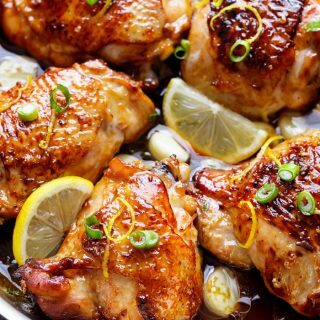 The perfect chicken dinner filled with zesty and sweet flavours, you will love this Honey Lemon Garlic Chicken! Pan fried first to get that crispy skin, then baked to cook them all the way through, this is one of those chicken dinners you’ll be forgiven if you make it once a week. Plus, the optional bonus of making more sauce on the stove top, until it thickens and caramelises in its special honey way, for extra drizzling to serve. I’ve made this as easy as I can for those rushed weeknights. It’s literally a case of whisk everything together, bake and done! I’m not going to lie here. Every time I make this sauce, I’m caught between stirring it and blowing it like my life depends on it, trying to cool it down so I can keep drinking it from a spoon. Yes, I shamelessly admit this happens straight out of the pan. The problem when finally making it for my blog is, I had husband and children behind me, breathing down my neck waiting for me to finish. 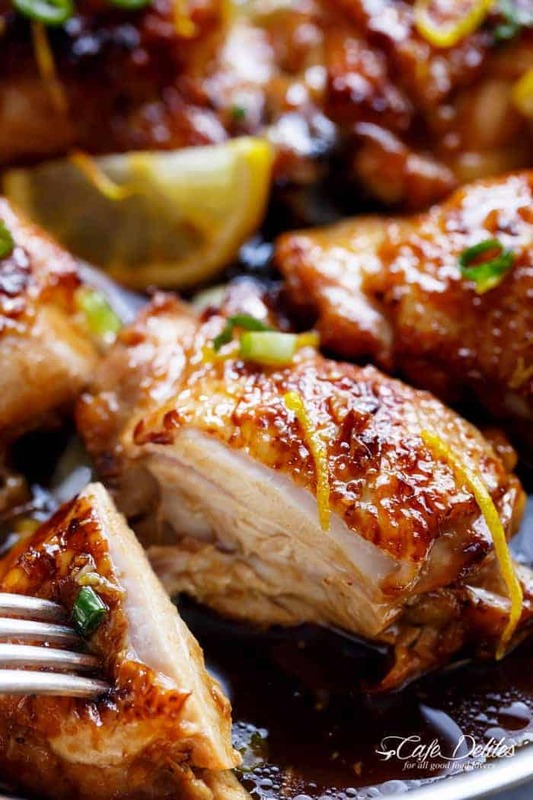 Now, there was a time we tried Honey Lemon Chicken, and while it’s nice and all, adding garlic to the recipe just takes it to a whole other level of flavour. The chicken is juicy, the skin comes out crispy and sticky all at the same time. And let me just add, I have a lot of time for sticky chicken. Much like these Sticky Thai Chicken Wings. 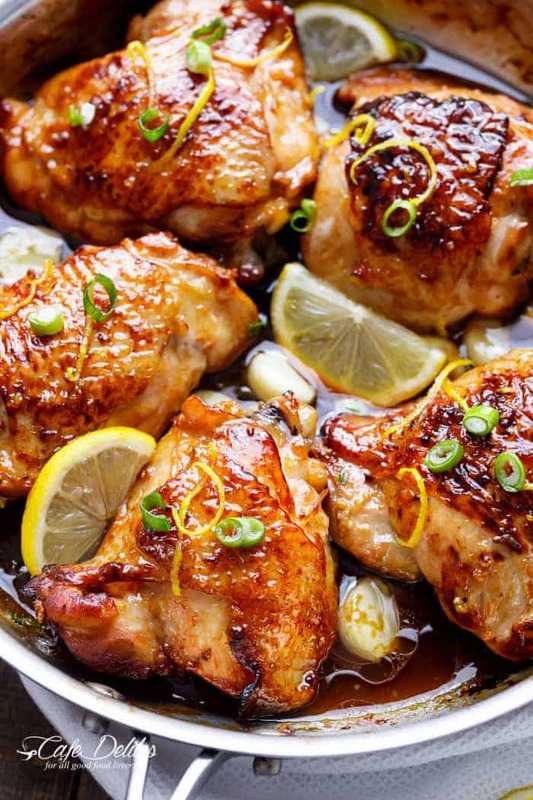 This is one of our dinners that you’ll see me running into the supermarket to buy only chicken thighs because I have the rest of the ingredients at home. I LOVE it when I have ALL the ingredients. I mean, HELLO SUCCULENT Honey Lemon Garlic Chicken. This is my third or fourth time making this. It has become my boyfriends favorite dish. Delicious juicy and tendet chicken with a delish sauce! Definitely make a lot of that reduced sauce EVERYONE will want more and more of it! I just made this tonight for dinner. It was highly favored in my house tonight. I will be trying to recipe soon. But I just have a question about step 4. We must drain the honey, soy sauce mixture and leave the equivalent of 1 tablespoon but eventually add back with the remainder of the mixture? How do you think it would taste if i added rosemary? I’m so happy to hear that Lain! I hope you’re enjoying some others! I made these chicken thighs tonight and they were so incredibly good!! Thanks for the recipe, it’s definitely a keeper!! i have printed out so many of your recipes and I am gonna try all of them. I am on a strict diet, on this carb cycling diet. i was looking for recipes to meal prep. And I found you 🙂 I am supposed to use as less fat possible while cooking my meals and no sodium. And the ingredients I use like the soy sauce should have low sodium. I have a few questions, what can I use in place of rice wine Vinegar if i dont have that. is there anything that can replace honey? from your recipes. i made the balsamic glaze chicken and it was yummy..loved it. Yet to make this one. What kind of side besides rice could go with this? Hi Rosa. Yu can serve this with steamed vegetables like broccoli, or noodles! Is it possible to skip the stove top step and just cook the chicken in a aluminum pan in the oven? Hi Anna! I searched thru Pinterest and decided to try this recipe. I used Apple cider vinegar and garlic cloves, but it still came out great. The skin has to be the best part. I’m not sure what made me try it, but I am so glad I found this recipe and took a chance. Two thumbs up!!!! I’m so happy to hear that Kelly! Yay!! Want to try this recipe just wondering how to cook this using chicken breast? I made this tonight and it was so yummy! I didn’t have rice wine vinegar so I used apple cider vinegar and it still came out great. Thank you! I made this for dinner, tonight, and it was delicious! It’s, pretty much, a one pot meal. I didn’t change a single thing with your recipe. It was gone in a nano-second! Thank you for the recipe. It’s a keeper! Hi, Is it possible to use Chicken Breasts instead? And if so what would the timing be for the oven etc? Yum!!! I will! That sounds incredible too! Thank you for that Shaz. I’ll post it once I make it! Doesn’t the honey mixture burn to the pot while you’re browning the thighs without oil in step 4? Thanks. Hi Linda. No it doesn’t burn. Karina! I love you! THANKYOU for this and all your recipes! 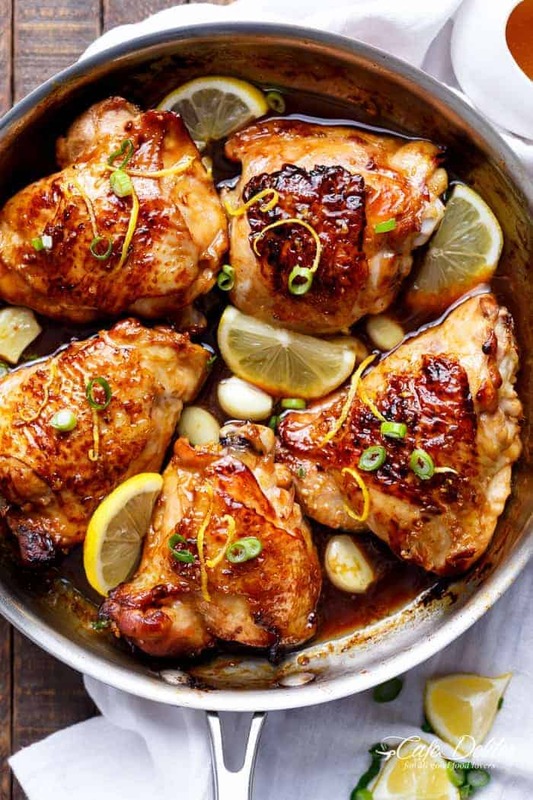 Can this be done with boneless skinless chicken thighs? What’s the cooking method you suggest for boneless skinless?